Display Advertising 101 – The Basics | AdsWiki - Ad Network Listing, Reviews, Payment Proof & Advertising News. Online advertising and branding are crucial components of the success of any modern business. There are a number of ways to establish your brand in the marketplace, and there are also several ways to directly track the interactions, conversions, and other important metrics of your advertising investment. One of the most common and efficient means of strengthening a brand online now is through display advertising. Display ads contain graphics such as your logo, copy, and sometimes even video and/or audio components. Think of them as the digital version of the eye-catching ads found in newspapers and magazines, only more precise and targeted to individuals who are likely to click on the ad (at least) and hopefully convert into a customer. 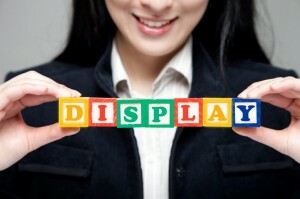 Read on to learn the basics of display advertising. Display ads can be placed basically anywhere on a web page, and are typically seen as banner ads at the top and sides of the screen. This type of advertising is important when it comes to promoting a specific brand. A company may choose to promote their brand on a website that involves heavy traffic such as Facebook or a popular blog, but they can also be placed on more specific sites that are related to the product or service being advertised (e.g. you might find an ad for kitchen gadgets on a famous chef’s blog). The ultimate goal of a display ad is for viewers to click on them and create a conversion, but even if this doesn’t happen viewers become aware of a company, thereby establishing branding. Display ads can extend well beyond typical banners on websites in the form of text ads and pop-ups. Some brands might choose to push the boundaries of design, include video and audio components, or even create an interactive game. Creativity will greatly enhance the success of an advertisement and the choices are unlimited. Catchy and effective copy, layout, color, and graphics draw customers in, creating more site traffic and brand awareness. Granular targeting abilities are part of what makes display ads so successful. Geo-targeting, which is beneficial for businesses looking to target local consumers, is an example. In this case, ads will be displayed to local audiences who search online with keywords that specify a location. In the case of demographic targeting, ads are posted on web pages that are frequented by people of similar age, income, and gender groups to those that match the typical customers of the business. Display ads use cookie and browser history to gather this data and target certain searchers. This makes targeting those who would be most likely to use a service or product much more effective overall. As opposed to traditional advertising, online advertising will greatly enhance the effectiveness of your display ads. You can accomplish a much greater reach of potential customers in much less time. Another benefit of using the Internet for display advertising is that you will be able to update the promotional message easily, and at your will—online advertising can be a DIY endeavor completely. You can personalize your message to your specific target audience, updating it here and there so that there is more variety involved than a single message. You can highlight discounts or special offers in these messages as well to further attract customers. Remarketing (or Retargeting) is a great way to reach out to your lost visitors by serving them targeted banner ads. Here’s how it works: you work with a company that provides Remarketing and place a pixel on your website. When a visitor gets to your website they will be cookie’d and added to your Remarketing population for targeting at a later date. Then, when they are on other websites featuring ad space, that code will see the cookie on their computer and display your Remarketing ad. It’s a really great way to keep the conversation going and bring abandoned visitors back to convert. Another benefit of display advertising online is that you can analyze metrics at any time to see what you’re doing right and what could be improved. In the case of outdoor, newspaper, TV, or radio advertising you can never be sure how many people have actually taken notice. With online display advertisements, you are able to track the number of users who clicked on your ads and also those who completed purchases or other conversion activities. The business can then adjust the campaign as necessary. An additional benefit, as opposed to other forms of advertising, is that businesses will be able to set a cap on their advertising budgets. Some Internet marketing savvy business owners like to handle their display ads and other online ads themselves. But there is also the option of hiring a professional. If you aren’t comfortable with the responsibility of managing your online ads, you should be sure to let seasoned professionals handle them, as you’re more likely to see the best and quickest results this way. Soon, you will be reaping all the benefits that display advertising has to offer for your business, no matter what products or services you may be offering. One Response to "Display Advertising 101 – The Basics"